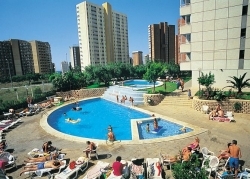 The Flamingo Playa Apartments are located just 700 yards from the centre of Benidorm and only 800 yards from the beach. The complex provides a full entertainment programme daily, and is great for families with children or couples. The apartments are spread across two buildings housing the apartments, bar, reception and restaurant. All apartments at the Flamingo Playa complex overlook the pool area, have views over Benidorm and are equipped with a lounge/kitchen, bathroom & balcony. "Air Conditioning In the Room A Little Disappointing"
I really enjoyed my holiday at the Flamingo Playa. We loved it so much, were going back next year with a group of my family & friends! The food was a little bland and boring at times, which is often the case with hotels in Spain! The evening entertainment was good and provided something for all ages! We found the lack of air conditioning in the room a little disappointing, after all it is the 21st century! It simply gets too hot in Benidorm in July to be without air con. Were really looking forward to our next holiday in Benidorm, but will possibly need to buy a fan for personal comfort.